JusTea is all about relationships. And we are so fortunate to have formed a partnership with a local company called PotteryWorks. I sat down with the founder/owner Dee, and learned a bit about what makes PotteryWorks so special. 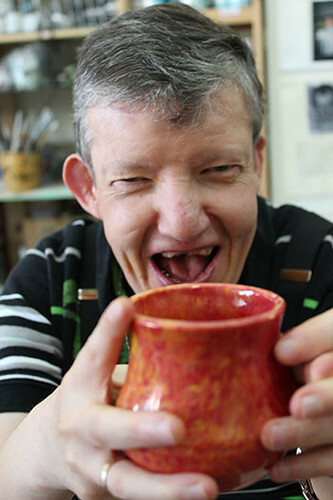 PotteryWorks is a collective of artists overcoming disability through their art. PotteryWorks is closely linked with an organization called the Community Living Society. 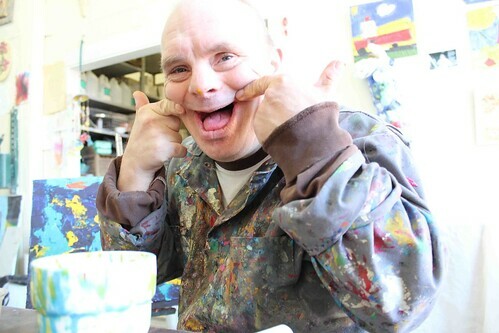 CLS offers personalized support and employment to adults living with disabilities. For more information on the Community Living Society, visit their website here. 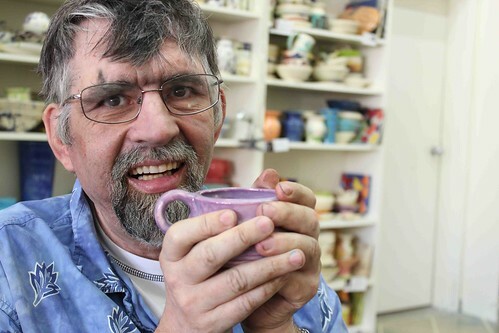 PotteryWorks was started in 2000 after Dee felt a disconnect between the two worlds in which she worked: as a professional artist, and in group home care. A talented potter and painter herself, she wanted to create a means of combining the two worlds. Dee happened to be channel surfing one day, and landed on an episode of Oprah. The episode was centered around the theme of living one’s life with purpose. This spoke to her, and the idea of using her artistic talents as a means of support for those living with disabilities was born. She partnered with a friend, and designed a business which would provide the training and equipment needed for people with mental or physical disabilities to create their own works of art, and display and sell them to the public. The company grew from its humble roots of two people and a vision, to its current 40 members active on a daily basis. PotteryWorks operates out of two main locations: a warehouse in Burnaby, and a store-front in the New Westminster River Market. The Burnaby location is where the artists are encouraged to learn and experiment with different mediums including canvas, pottery, and hand-painted greeting cards – all under the instruction and supervision of Dee and other professional artists. The original aim was to teach the steps necessary to make a profit from one’s art: from step one – ideation, all the way to creation, exhibition, and selling the piece. For many, the art is what it’s all about, and they take their work very seriously.For some though, art is simply a launching point to other yet-unexplored opportunities. One woman started her journey with PotteryWorks as a painter, but has since started working in the office. She hopes to gain experience in bookkeeping so that she can begin to build a professional resume. PotteryWorks is an organization which has inclusion and giving as part of their core values. They given so much to the community, and we at JusTea are honoured to call them friends. If you wish to support PotteryWorks, please purchase one of their beautiful mugs in our online shop, or visit their shop in the New Westminster River Market.